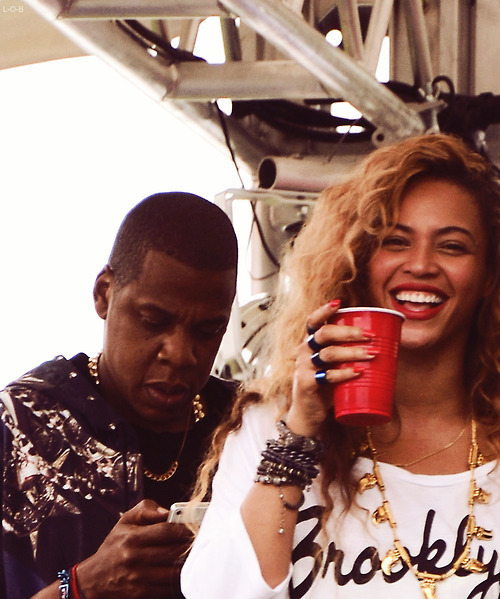 EXCLUSIVE PHOTOS: Beyonce Spotted Sporting New Bleach Blonde Wig + Shooting A Music Video With Jay-Z Down In Miami! Beyonce Grabs Lunch With Jay-Z In Venice + Bey Chills With Jessica Alba & Adds Iggy Azalea To Her "Mrs. Carter World Tour"
Yesterday, power couple Beyonce and Jay-Z was spotted grabbing lunch at Gjelina in Venice, California before the Hov's "Legend of the Summer tour" with Justin Timberlake at the Rose Bowl later that day. PHOTOS: Beyonce, Tina Knowles & Jay-Z ATTEND The Trayvon Martin VIGIL In New York City! On Saturday, Beyonce was photographed with her hubby Jay-Z and mom, Tina Knowles attending slain teen Trayvon Martin's vigil in downtown Manhattan, which was organized by Rev. Al Sharpton and started in Harlem. 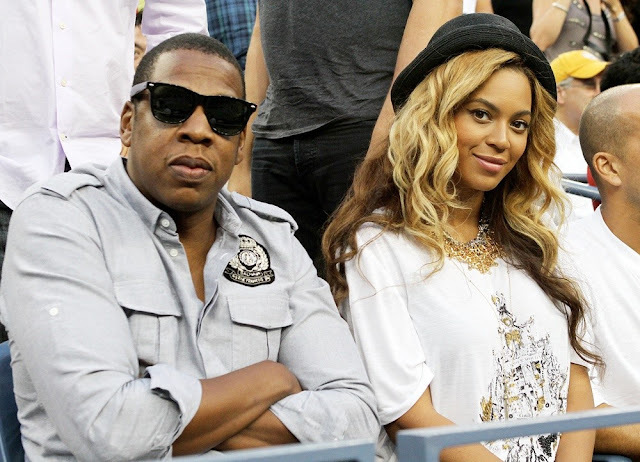 The power-couple certainly haven't been silent about their feelings on the Trayvon Martin verdict, and have both paid tribute to 17 year-old slain teen in separate concerts this past week. 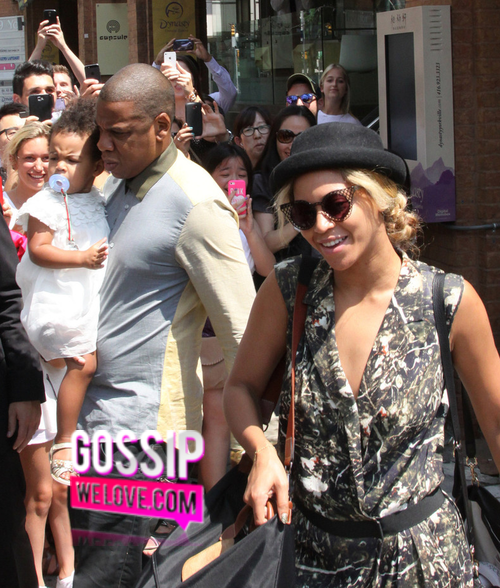 Beyoncé, Blue Ivy & Jay-Z Grabs Lunch at Cafe Nervosa in Toronto + Jay-Z's Samsung App Sparks FTC Investigation! 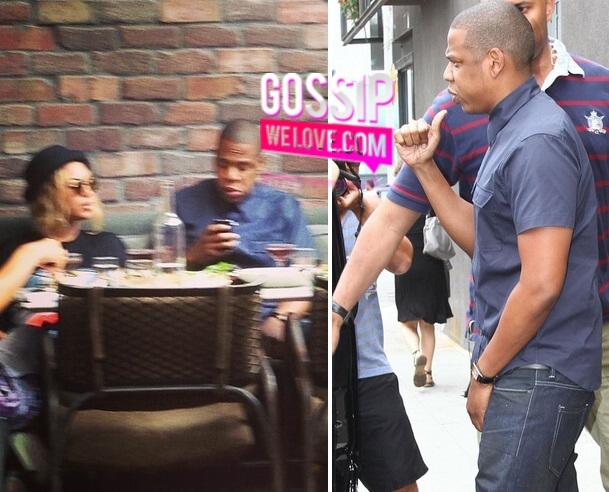 Earlier today, pop star Beyonce and her Roc Nation hubby Jay-Z spent some family time alone (before they hit their respective stages) while stopping to get lunch at Cafe Nervosa Trattoria in Toronto, Canada with their daughter Blue Ivy Carter. 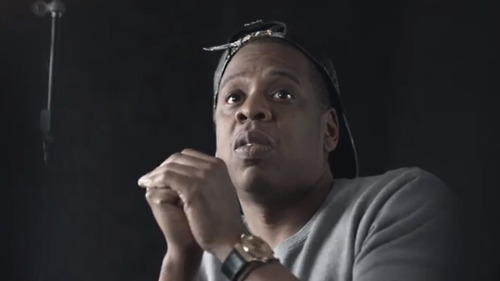 AUDIO: Jay-Z Receives His Platinum Plaque For Magna Carta Holy Grail Album + Talks Collab With Beyonce, Dame Dash, Miley Cyrus & More! 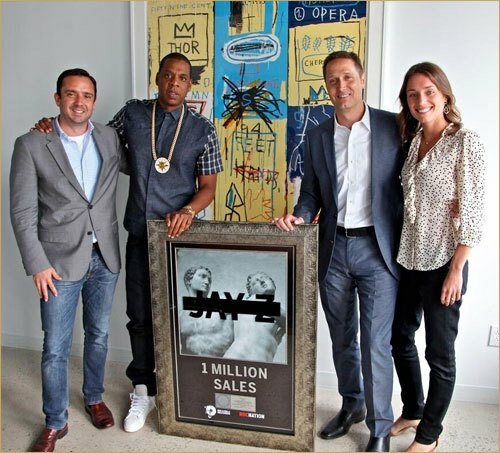 On Tuesday, hip hop mogul Jay-Z received his Platinum Plaque for Magna Carta Holy Grail album (officially released on July 9th) by the RIAA. The event was tweeted out to the masses from the RIAA with the accompanying image (above). Just always a great collaboration! The Carter's are back at it again with the release of a new song entitled "Part II: On The Run" after releasing their hit single, "Bonnie and Clyde" ten years ago. 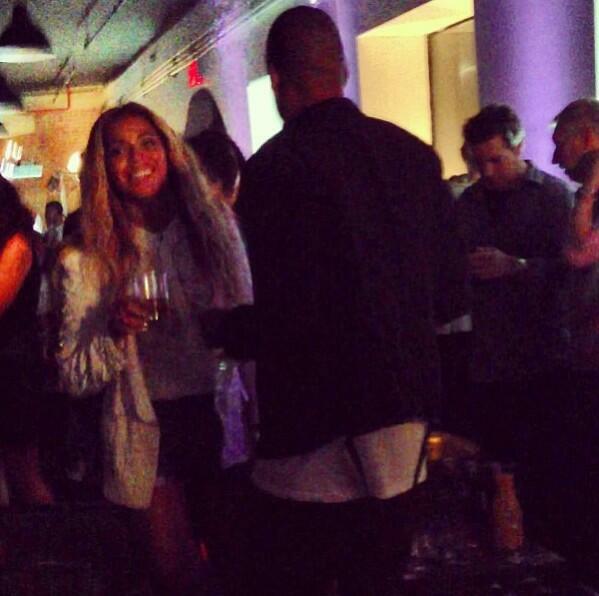 PHOTOS: Jay-Z, Beyonce, Adrienne Bailon, & More Celebrate The Release Of "Magna Carta Holy Grail" + "MCHG" Samsung App CRASHES! Despite Mr. Carter's Times Square bash getting yanked at last minute, rapper Jay-Z and his wife Beyonce was all smiles at a secret album release party at Liberty Warehouse in Red Hook, Brooklyn. The Samsung "Magna Carta Holy Grail" album release party was filled with celebrities like Nick Cannon, Emily B, Timbaland, Busta Rhymes, Adrienne Bailon, Tyson Beckford and more. 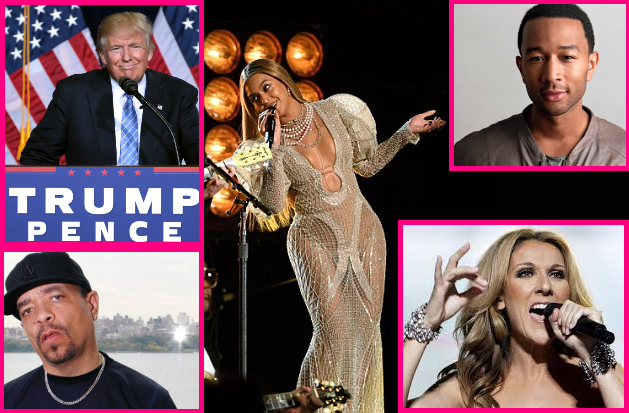 Bad News For Jay-Z... NYC Officials Has A Change Of Heart & YANKED APPROVAL Free Concert Bash In Times Square! There's some bad news for rapper and hip hop mogul Jay-Z who was denied a permit at the last minute to perform atop the Ed Sullivan Theater in NYC-- set for Monday July 8th for the "Late Show with David Letterman." IT'S OFFICIAL: New York City Officials Approve Jay-Z's Request To SHUT DOWN Times Square During Rush Hour! 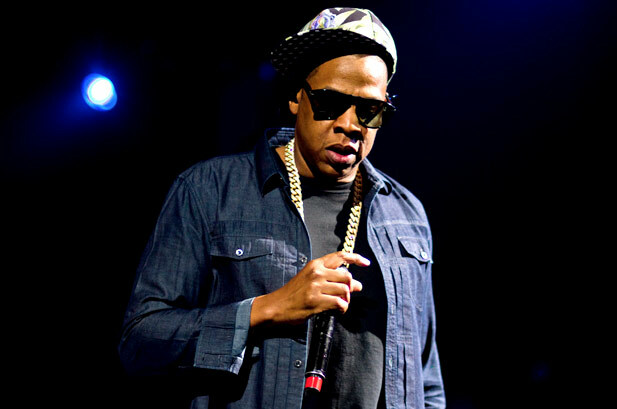 Earlier this week, we reported that Hip Hop Mogul Jay-Z was planning on throwing a free concert in New York City in celebration of his new album, "Magna Carta Holy Grail." Despite the idea being shut down in 2010 due to police officials concerns about uproar of traffic and danger to public safety, Mayor Bloomberg's administration office has finally granted Hov's request to shut down Times Square during rush hour on Monday, July 8th. The concert will be held on the Marquee of the "Late Show with David Letterman" while also airing on the show. And as reported, Samsung recently purchased one million copies of Jay-Z's album "MCHG" at $5 each and set to release them exclusively on July 4th via a new app on the Samsung Galaxy S4 Smartphone. 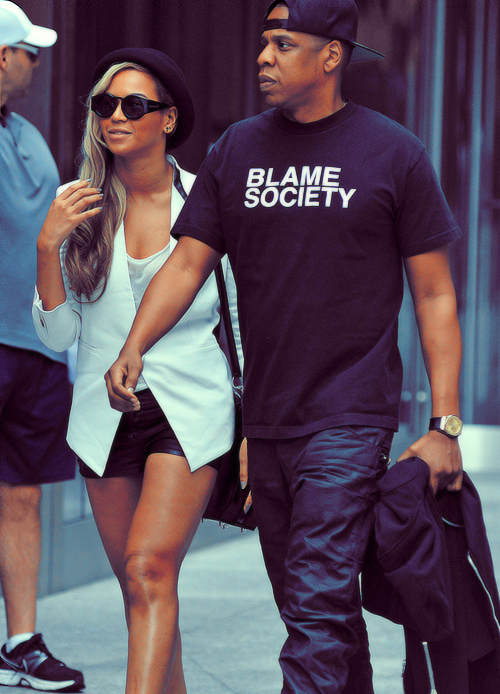 Rapper Jay-Z Release The Official Lyrics To His "Blue" (Daddy Dearest) Track + Blue Ivy Carter Gets Crowned! Rapper Jay-Z has the released the official lyrics to his new single, 'Blue: (Daddy Dearest)' a track he created specially for his daughter, Blue Ivy Carter.